Two of the adverse consequences of being ungrounded are that it can cause a person to be too easily swayed by the opinions of others, as well as be fooled by any of the many deceptions in our world. These are reason enough to put a consistent, daily focus on being fully present in your body and powerfully grounded to Earth's core. I could go on and on about the pitfalls and dangers of being spacey, ungrounded, partially out of body, etc but I will leave that aside in the interests of keeping this article short. First, Get Into Your Body! Many people are chronically partially out of their body due to a variety of conditions, some of which include: unhealed past physical or emotional traumas, living out of contact with the earth (cities, apartments, etc), doing "out of body" meditations, excessive daydreaming, unwillingness to confront the darker aspects of the subconscious mind, excessive use of alcohol or other drugs, over-consumption of television and other forms of digital entertainment, too much "cleansing" / calorie-restrictive dieting, and more. The "Higher Self Meditation" in the Self-Clearing System puts a focus on bringing your own Inner Light back down into your body because most people are literally floating above themselves energetically. A repeated focus on seating your energy in your heart center helps you to be truly IN your body. Keep in mind that the "Higher" Self is only deemed that because so much of our Sovereign Self is floating above the body instead of residing within it. Being fully present in the body can take a while, depending on how habitually disconnected and ungrounded a person has been in their life. Centering our energy in our heart center is the first, most basic step to restoring our full presence in the body, so that we can then get grounded. Even if you live in a dense urban environment, there will be parks and other places where some nature still exists. Seek out those places and put your bare feet onto the grass, dirt, sand, etc. While you're there with your feet on the ground, do the simple grounding meditation below and walk around for a bit. This one is so simple that many people totally overlook it, or they prefer to plug in a "grounding pad" and call it a day. I have nothing against grounding (aka "earthing") devices, but they cannot replace the value of being barefoot on the ground. Swimming in natural bodies of water, walking barefoot on the beach and hiking in natural settings are also good ways to directly, energetically connect to the earth. If you are hiking in boots, stop often and touch a tree or plant with your bare hands. 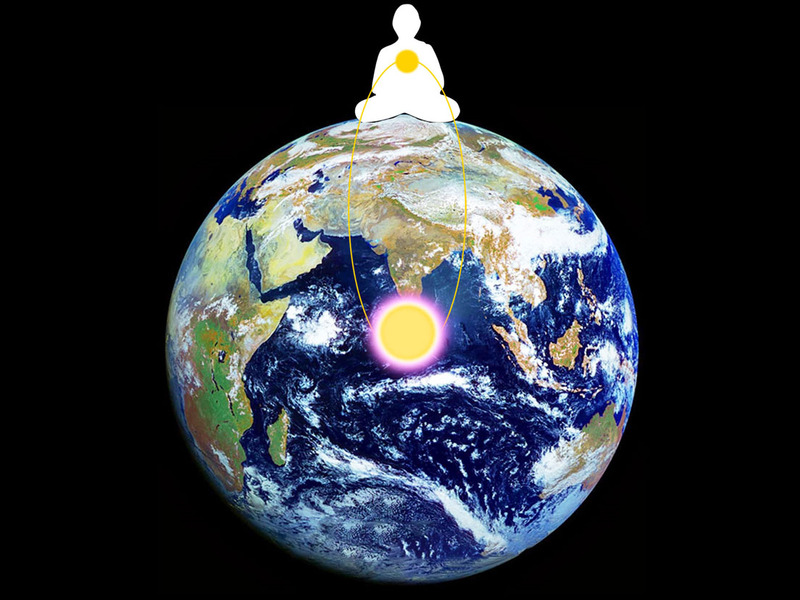 Through the process of energetically connecting our heart to the heart of the planet, we get deeply grounded in a very powerful, stable way. To me, this is the most potent form of grounding, although it works best when used in conjunction with the above steps. However, don't let the fact that you are in a high rise building, or that it is too cold outside to put your bare feet on the ground stop you from doing the simple process described below. It can be done anywhere, even if you are flying in an airplane. Before we get to the process, I want to mention the curving energy lines used here. While it is more simple to visualize a straight line of energy, I have learned that curving lines of energy are more natural and more aligned with our foundational reality as Sovereign extensions of Source than straight lines of energy, which tend to be more mechanistic and synthetic. Again, I could go on at length here, but I will keep it brief and use a picture to serve as a visual aid for this concept (see photo at the top of this article). My Simple, Daily Grounding Focus. • Close your eyes and take some slow, deep breaths. Center yourself in the present moment. • Focus on your heart and visualize the energy of your Sovereign Inner Self growing large and bright. • Send a beam of gently curving energy out of the left side of your chest that goes downward into the earth. • Visualize this energy gently curving in a long elliptical arc, eventually connecting into the left side of Earth's core. • Visualize another curving line of energy emanating from the right side of Earth's core, gently curving up to eventually connect into the right side of your chest. • Spend a few moments enjoying the feeling of connecting and synchronizing your heart center to the heart of the planet. • State your intention to keep yourself fully, deeply grounded and connected into Earth's core. • Open your eyes and go on about the rest of your day in this deeply grounded state. I highly recommend that you repeat this several times during the day whenever you have a spare moment. It only takes a couple of minutes, and with practice over time you will be able to maintain this connection throughout your day. Even if you are 20 stories up off the ground in an apartment or office building, you can still do this simple process. In fact, it is even more important to do so in that type of environment than if you're a woodland hobbit kind of person like me. Ideally, when you are walking, standing or sitting barefoot on the grass (and after you have connected your heart center to the heart of the planet), you can do some physical exercise that will help you get more connected to your body. Again though, if you can't be in direct contact with the ground, you can still do some grounding physical exercise. This can be just about anything that you like to do, provided that it does not make you feel "spacey" or too light-headed. For example, those who are familiar with a set of exercises called the "Five Rites" could do those movements, but I strongly recommend that you omit the first spinning movement, at least for a while. This is because spinning can create a spacey, out of body feeling, especially in a person that is already ungrounded. Do the other exercises first for a while, then slowly, very slowly, add in a little bit of spinning. Just make sure to ground yourself after the spinning portion, and if it takes too long, do less spinning (or none) next time. If you are into yoga, do a combination of easy and mildly-challenging movements, but omit any extended pranayama at first, for the same reasons as omitting the spinning. If you are not into any of the above, just do some planks, push-ups, bodyweight squats, go hiking, or anything else you enjoy doing, making sure that you stay within your body's limitations. Pushing the body too hard while exercise can also be ungrounding, so if you feel your body asking for a rest, then rest! While I don't think a "perfect diet for all humans" actually exists, I have found that incorporating organic root vegetables and organic greens into a calorie-dense diet can help with efforts to get fully into the body and be grounded. The root vegetables are pretty self-explanatory, they grow underneath the ground, and they help pass along some of that groundedness to us when we eat them. Greens are grounding due to their mineral content, but I must stress the importance of combining root vegetables and greens with calorie-dense foods. Any type of caloric restriction can be very ungrounding for a person, even when the diet is high in micronutrients, so it is important to have both micronutrient density and caloric density in one's diet. This means eating things like rice, potatoes, sweet potatoes (hey, those are root vegetables, too! ), wheat (preferably Spelt instead of "glutenized" American wheat), avocadoes, eggs, coconut oil, butter, other dairy products and (real) honey regularly. It can even mean having some ice cream once in a while (yay!). Organic is always preferable, but don't stress out over having a perfect diet, as that stress is worse than eating non-organic food. Just for clarity: Please do NOT just eat root vegetables and greens, because you will not have enough caloric density to support a strong metabolism, and you will end up ungrounded, hungry and feeling cold all the time without sufficient calories. For those of you who eat meat, try to get organic / grass-fed whenever possible. Those of you who don't eat meat will need to make sure you are getting plenty of calories from other sources. The main key to being energetically present in your body and grounded is awareness and being conscious of how you feel as you move through life. These are a few indicators that you are not fully present in your body and ungrounded: Feeling spacey, difficulty focusing on one task, easily losing track of conversations when others are talking, misplacing your keys/phone/spouse/child/dog/etc, poor coordination, forgetting something that happened just moments ago, etc. If you notice any of those things happening, or anything else specific to you that you know is an indication of being unpresent / ungrounded, get tuned into your Sovereign Self via your heart center and connect your heart to the planet's heart via the simple process above. If you can incorporate the physical grounding practices into your daily life as much as possible and do your energetic grounding work, you will notice many positive benefits including an increase in your capacity for holding and utilizing energy in your body. This will allow you to do more intense types of energy-work without getting ungrounded in the process. I hope the information and techniques in this article are helpful for you. I thank you for your support, presence and attention. For those of you who have emailed me and didn't receive a reply, please know that I do read every email, but I cannot reply to them all, and I am currently backlogged on email replies by almost a week.